It seems there’s a recruiter at every corner these days, it’s a massive industry with lots of companies on the look-out for their latest recruit. It’s no wonder it’s one of the fastest growing industries. Online is no different. Monthly searches are averaging the 40,500 mark for the phrase ‘recruitment agencies’, and the amount of results this pulls up on Google is just phenomenal. Just how exactly do you break through the crowd and keep your head above the water in this crazily competitive world? It’s not a simple fix, SEO, it takes time. And lots of it. Think of SEO as a craft, a skill, and as we all know Rome wasn’t built in a day. There are tons of elements that you can optimise both on-site and around the web to make sure you’re on top of your game (or, at least, on your way there), and we’ll look to explore some of them in detail throughout this post. At this point, it’s worth noting that SEO is very much a long-term commitment, and not at all a ‘quick fix’. There’s just no way to rank at number 1 for all job oriented phrases within a month. Google, fortunately, or unfortunately, depending on how you look at the situation uses many metrics to determine how and who to rank. The job of an SEO – in all industries, not just recruitment – is very much problem solving and understanding where potential issues may have arisen and getting to work to resolve them. A mistake that a lot of businesses make is that they are so in-tune with their internal dialogue and terms used in the industry, that they are out of touch with user language. If the user intent is to find a job, but a job title or description is shortened within a department or industry, it doesn’t mean it’s a universal language that is being spoken across the audience. Ultimately, if you shorten job titles internally, are users searching for these terms? If the answer is no, it’s worthwhile cutting back on the jargon and using simple language on your site. The easiest way to figuring this out is to look at the search volume on keyword tools such as Keyword Planner to find what users are searching for, what is popular, and how you can capitalise on it for your own marketing efforts. An issue with hyper-local search terms relating to jobs is the search intent and searcher location. If location is enabled on a device, typically Google will pull up the most relevant results for the location specified in the search as well as the location specified on the device. This can have contradicting results and can affect the visibility of the rankings. Search engines will also use your stored cookies to make recommendations on the back of what you have previously viewed which can also skew results for users as it becomes more personalised. That’s why – and so critically – it’s important not to get hung up about when rankings slightly fluctuate from day to day or week to week. Of course, you need to be monitoring your main top-level keywords to see how you’re performing in the industry against competitors; however, you don’t need to be ranking for anything and everything. Sure, you’re a recruitment agency, but if your focus is solely for veterinary recruitment, for example, then placing efforts into ranking for ‘recruitment agency’ is dead in the water, expensive and extremely competitive. Your product offering is so targeted and niche that user intent will be looking for a recruitment agency specialising in sourcing vets. Building on-page content that includes relevant keywords is really important for ensuring that your site or one of your landing pages is pulled up on the search engine results pages (SERPs). Optimising your specific landing pages for the keywords you’re hoping to target is an element you can’t go wrong with (unless you count healthy fluctuations). In recruitment, candidates may prefer to chat or engage with the consultant rather than the actual business. We find that this is from a built-up connection to their ‘preferred’ recruitment consultant. For recruitment agencies to become more connected they can utilise the link facilities on social media and track the link clicks through Tweet analytics and Google Analytics features by using a campaign builder for each individual job posted, and to see who exactly is driving the most results throughout the business. Aside from content itself, another key metric for boosting SEO efforts is through engagement and connection with the audience. No doubt as a recruiter you’ll be working consistently with a lot of companies so why not have them link to your site from theirs? If you are an exclusive partner to a particular organisation, have them set up a link on their site (and, of course, do return the favour). Go to events, get your name out there, and ultimately get links fed back to your site with each and every event you get involved in. Real-world partnerships and networking easily feed into online efforts. Local SEO is key in particular industries. 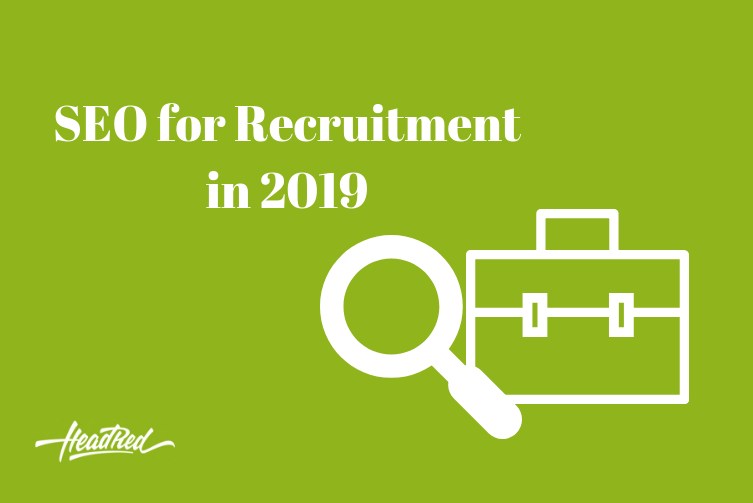 Recruitment is a great example, as users – usually job searchers – are typically looking for recruitment services in their area, or will search with the intent of finding local roles as to where they are positioned. Whether you’re a national, regional, or single recruitment company, there’s a local SEO strategy that you can take advantage of. When Google crawls your site in the event of a local keyword search, it doesn’t understand that ‘024 76’ is the local Coventry code for a telephone number, it will simply read it as another sequence of numbers. Implementing structured data through a tool like Google Search Console or schema.org will tell Google the geographic area of the number, therefore, pushing your site higher for more localised searches. It also helps to identify your business as a business using the localBusiness or Organization markups as more digestible information to Google than stacks and stacks of unorganised jargon. So, ensuring you have the local code and not a mobile number on your website, and on your Google My Business listing, you’re already skipping miles ahead. Don’t have a Google My Business listing? Head here and set one up now. It’s quick, it’s easy and can see you ranking in the SERPs with searches showing map results too. Our complete Google My Business guide should help you get started! 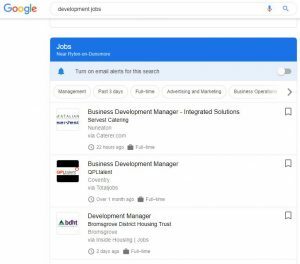 The newest Google feature, which launched last summer, is the Google Jobs portal. It feeds jobs from all over the web into one handy user interface. Results appear by using the term ‘jobs’ in the search query. Google is working with some of the UK’s largest recruitment services such as Reed, Guardian Jobs, Haymarket and Total Jobs, so featuring in the snippet is a little competitive. Optimising your site with structured data will make it easier for Google to crawl your site and pull up the relevant information to feature here. The Google Jobs feature is still in its infancy, so, from a data perspective there isn’t an awful lot that we can cover at this stage. However, as the feature gets more advanced with updates, we’ll be covering more on the topic! If you need some advice, our friendly team of SEO experts are always on hand to help. Give us a call or drop us a line, we can’t wait to hear from you!